Happy new year! We at Catherine’s are ready to start the new year prioritizing our health, and we invite you to join us! Check out our January Healthy Living Newsletter and the January & February North End Wellness Coalition Newsletter for health-focused events and activities in our community. 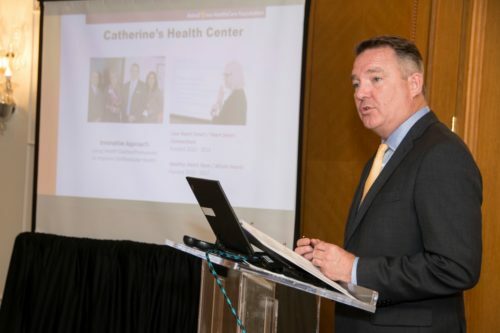 We’re thrilled to share that Catherine’s is one of eleven organizations nation-wide to be funded by AstraZeneca HealthCare Foundation Connections for Cardiovascular HealthSM for the coming year. In addition to continuing our efforts to improve our patients’ cardiovascular health through the Live Heart Smart suite of programs, we will begin mentoring two newly-funded organizations to help them successfully launch and manage their programs. Please join us in thanking AstraZeneca HealthCare Foundation Connections for Cardiovascular HealthSM for their generous funding! We also invite you to join us in welcoming our new friends at the Asian Health Coalition in Chicago, Illinois and the Sisseton-Wahpeton Oyate of the Lake Traverse Reservation in Agency Village, South Dakota. We’re eager to learn from each other and build & sustain innovative community-based programs to improve heart health across the nation.